BASE CARDS– 300 of the leading MLB stars, Rookies and retired greats, as well as champions off of the baseball field. ALLEN & GINTER FULL-SIZE RELICS– Up to 120 subjects featuring MLB Players, world champion athletes, and personalities. WORLD TALENT (50 Subjects)– Showcasing the national pride of various MLB® players from across the globe. FANTASY GOLDMINE (50 subjects)– MLB stars of yesteryear are highlighted alongside modern-day sabermetric stats. WORLD’S GREATEST BEACHES (10 subjects)– Some of the most iconic areas of sand and surf are immortalized here. BASEBALL EQUIPMENT OF THE AGES (30 subjects)– The evolution of baseball equipment is shown in this 30-card set, from the game’s inception to the modern day. MAGNIFICENT MOONS (10 subjects)– Planetary satellites take center stage in this solar system-spanning set. INDIGENOUS HEROES (25 subjects)– North and South America’s most notable names from Native American and First Nations history. WORLD’S HOTTEST PEPPERS (15 subjects)– Can you stand the heat and collect all 15?!?! FOLIO OF FEARS (10 subjects)– Cards depicting some of people’s biggest fears. Don’t be afraid to collect them all. 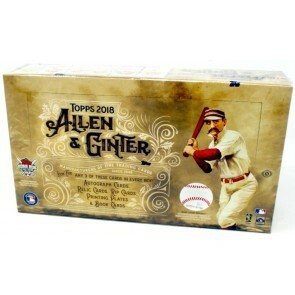 ALLEN AND GINTER BOXLOADERS (15 subjects)– The game’s most collectible rookies and stars.